D.C. Henge at I Street N.W., by Will Atwood Mitchell. Science time! Normally, we'd be due for a special phenomenon of amusement and prettiness: D.C. Henge (since Stone Henge doesn't get to have all the fun, and we have much better bathrooms here). 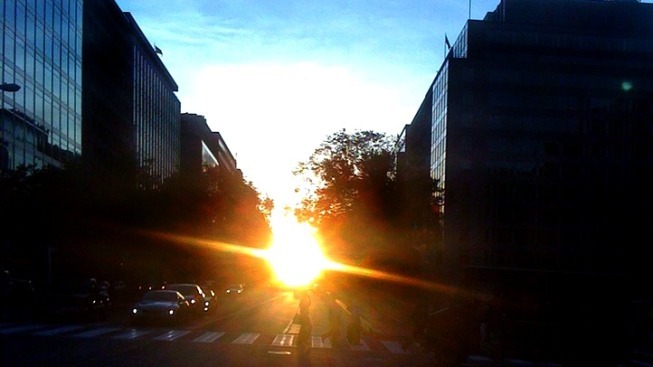 Because D.C.'s lettered streets downtown run exactly east-west,we can see the sun rise and set directly between the buildings, twice a year at the spring and autumn equinoxes. Twice a year, in September and March, the Earth’s axis of rotation is perpendicular to the line connecting the centers of the earth and the sun. These are known as the autumnal and vernal equinoxes. And, because the streets of Washington, D.C. align on an east-west grid, the sun will rise and set in line with the city's traffic. The various city-named "henges" are credited to astrophysicist Neil deGrasse Tyson, who coined "Manhattanhenge" for the streets of New York City (which do not align exactly east-west; thus "Manhattanhenge" falls on a different day from D.C. Henge). However, we're in for a lot of rain this weekend. We would tell you to look for D.C. Henge at sunset tonight, around 7 p.m., and then Saturday morning at sunrise... but we're probably not due to actually see much of the sun until Monday, said NBC Washington meteorologist Tom Kierein. Since the sun appears to move in our sky pretty slowly, you should still have a decent view on Monday. Otherwise, the spring equinox will occur on March 20, 2012. Image by Will Atwood Mitchell.